Today I received Zoya's Cyber Monday Mystery Box 2015 in the mail, and inside the three mystery polishes were the Redbook Trio. I want to draw your attention to the red polish of the trio, Renee. At first I thought, okay...another red... Then it was growing on me and I was considering keeping it because, hey, one can't really have too many gorgeous bright retro reds, right? Yeah...one can, which I should know better because I've done this one too many times now. 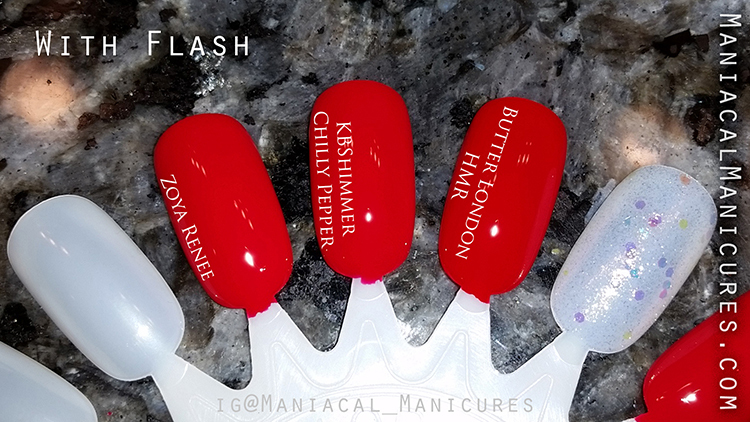 So I found my lovable Chilly Pepper from KBShimmer's Winter 2015 collection and my go-to Her Majesty's Red from Butter London's Patent Shine 10x collection. They were all virtually a perfect match, and believe me, it is hard enough to distinguish them in person. Chilly Pepper leans a minute more blue-toned, but it's virtually impossible to tell. Her Majesty's Red leans a minute more orange and is just a touch darker, but again, it's virtually impossible to tell. They are each a dupe for each other, and I mean Dupe with a capital "D." So what is nail polish addict to do? Discuss each at length of course! But first, photos! And now for the reveal! Observe! Two medium coats each with no topcoat. Zoya Renee is a great formula that is fully opaque on the second coat. You could almost get away with one thick coat, but there is still risk for VNL. The formula isn't too thin or too thick, so you can get good coverage without much risk for pooling in the cuticles. It's a gorgeous shiny creme that is on the bluer side of red, making it flattering for most skin tones. It's very heavily pigmented so there is a potential for staining, so I recommend always using a good basecoat or double up (especially with reds). This polish levels beautifully! Also as a perk, all of Zoya's polishes are vegan (seriously). KBShimmer Chilly Pepper is am amazing formula that isn't too thick or too thin. The first coat is a bit sheer, but good coverage. Color depth becomes more rich with a second and third coat. The swatch on the wheel is two coats, but on the actual nail it takes 2-3 coats for full opacity without VNL depending on how thick your coats are. I was surprised that I didn't experience any staining on the nail when I tried this recently, but I always use a basecoat. This polish also levels beautifully! 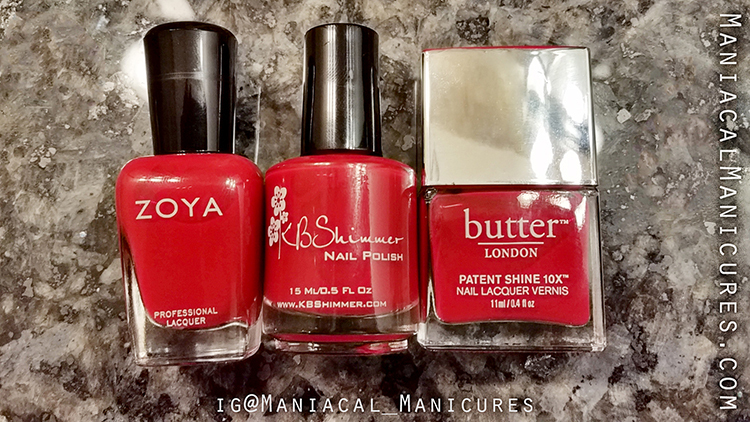 Butter London Her Majesty's Red is also a great formula, and being from the Patent Shine 10x collection, it has ingredients that make it more flexible and breathable for your nail than their regular line. The first coat was very sheer, and a thick second coat almost made the VNL disappear; I would recommend three thin coats if you have long nails, but if you have short nails with little-to-no free-edge, you could get away with two. This polish levels beautifully so long as you don't over-work your brush strokes. It's a litter thicker than the other two, but dries very quickly. So how do you know which one is for you? Okay, I'll admit it's tricky. I love all three brands and each has an incredible formula, so I can't say one formula sticks out as a clear winner. So let's look at price! KBShimmer Chilly Pepper retails for $7.50 on the KBShimmer website. Zoya Renee comes as part of the Redbook Trio, the trio retailing for $27.00. Butter London Her Majesty's Red retails for $18.00. If you want the most economical choice, KBShimmer is always a win without compromise on quality. If you want reasonable price per polish with additional colors, Zoya is a win. Though it puts it at about the same price as KBShimmer. 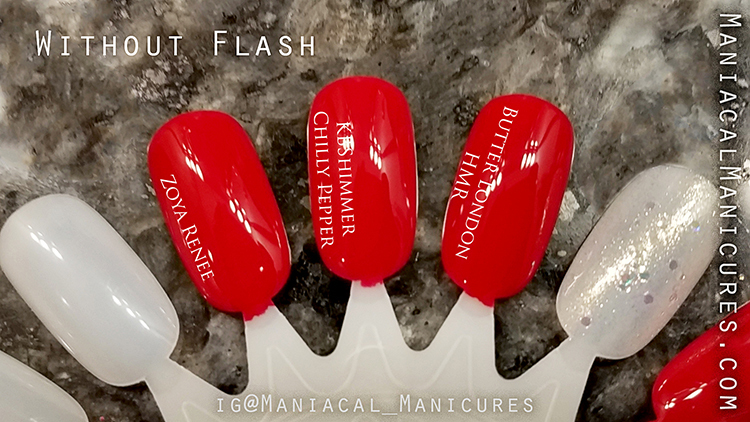 If you are looking for a more gel-like finish that dries quickly without needing a topcoat (think: in a rush and need an amazing polish, but don't have time for full manicure) Butter London is your best choice. I will say this, you don't need all of the above polishes, for they are dupes. I will definitely hang on to my Her Majesty's Red because it's one of my go-to polishes for quick out-the-door manicures and I love that's it's 7-Free. I won't part with my Chilly Pepper because it's KBShimmer and I love KBShimmer polishes (I know, I've gone into the irrational...). 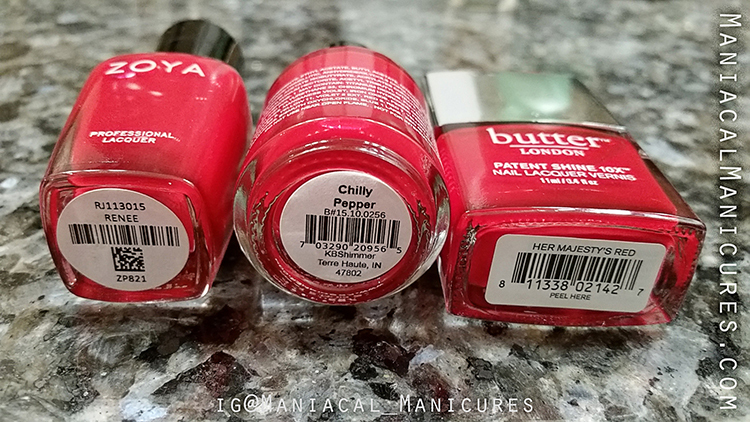 While I love Zoya Renee for its great formula and coverage, I have the other two so I'm going to gift her to a friend who never has enough classic reds--not to mention she shares my love of Zoya (win-win!). In conclusion, there is no wrong decision here. They're all amazing. If you're interested in more information and updates!